Did you know that the surface temperature of your roof can reach 150° F during the summer? Much of that heat will travel through the shingles and roof deck and into your attic. Without a proper ventilation system in place, that heat will continue on down into your homes living spaces. By removing and eliminating as much of the heat as possible from the attic, you will reduce the amount of heat that is radiated into your homes living area. 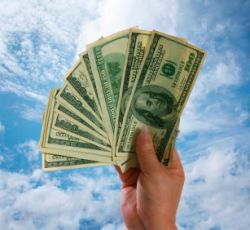 This will enable you to lower your homes air conditioning costs and extend the life of your roof. Air circulation is critical in keeping your attic cool. 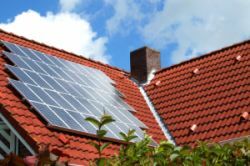 As the Sun beats down on your roof, it absorbs all of that solar energy which is converted into heat. This heat, or solar thermal energy, is transferred from your roofs shingles to the roof deck to the rafters and into your attic. Everything within the attic will absorb that heat and begin to radiate it in all directions, including into your home. By circulating air through your attic, it will pick up the heat radiated from the objects and structures in the attic and transfer it outside your home. In order for this to take place, relatively cool air from outside needs to be brought into the attic. 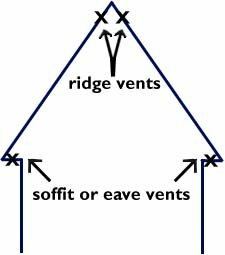 This is normally accomplished with soffit vents located on the eaves of the roof. Once that cool air is in the attic, it will start to heat up as it moves over the attic structure and objects. Through the process of natural convection, the hot air will rise. Near the peak of the roof will be ridge vents. The hot air will be expelled from the attic through the ridge vents. The challenge here is that in order to really cool your attic, you need to circulate a large amount of air through the attic. Unfortunately, for most homes, natural convection won't be sufficient. In order to circulate enough air through your attic you will need to use one or more attic fans. An attic fan located near the peak of your roof will draw out the hot air in your attic and help to pull in more cool air, repeating the whole process. If you want to save money on installation as well as on operational costs, you should install a solar attic vent. Traditional attic fans are powered by your homes electrical system. In order to install one in your home, you will need to hire an electrician to make the power connection. Solar powered attic fans don't require any additional wiring since they are powered from solar panels that are part of the unit. Since they are powered by their solar panels, you also will not have to pay for any additional electricity to run them. To learn about additional benefits, see our page on Solar Attic Fans. Since solar power roof vents don't require a licensed electrician to install, they make a great DIY solar power project. If you'd like to learn how you can install your own solar vent, take a look at our page on installing your own Solar Powered Attic Fan. 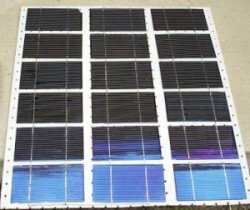 This page will help you determine how many solar roof vents you need as well as provide you with a step-by-step guide for installing it yourself.